Hi! My name is Andrea but everyone calls me Drea. I’m a Midwest mom of three wonderful children, married to my best friend and obsessed with my drowsy pug named Uniqua. I’m a former special education instructor turned lifestyle blogger. 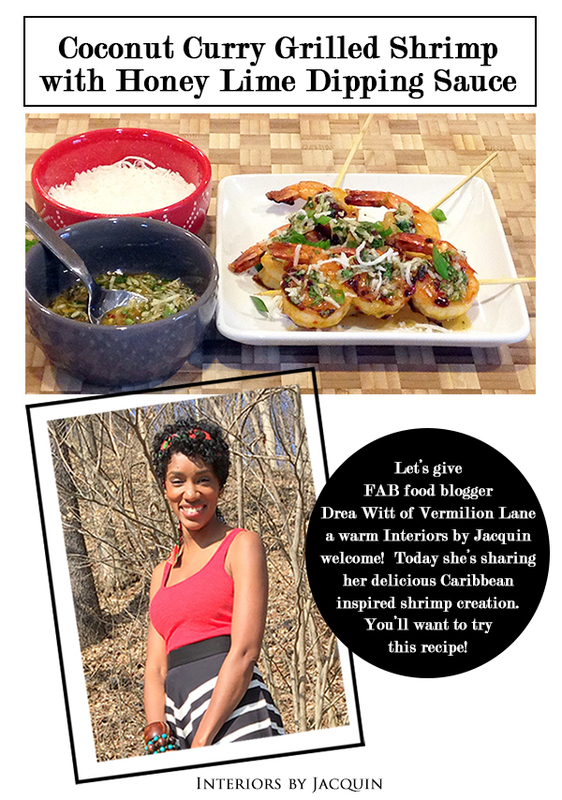 Vermilion Lane is my online journal of everything I love: cooking, fashion, family, crafts, interior design and more. Today I’m sharing my own recipe creation, Coconut Curry Grilled Shrimp, inspired by the vibrant Caribbean islands. I just love the flavors of the Caribbean! Whenever I try an amazing Caribbean dish I’m reminded of my wonderful honeymoon in Jamaica. Where else do Asian, African and Native Caribbean Indian spices blend so effortlessly? Caribbean cuisine is a global experience in and of itself! One of my favorite finds in Jamaica was high-quality curry. And boy do they curry just about everything from sautéed veggies to roasted goat, from “tip to tail”, as they say. Fresh coconut was another much loved treat on my trip. I previously thought of coconut simply as an ingredient in old-fashioned dessert preparations such as custard pies, cookie bars and fruit gelatin. My introduction to fresh shaved coconut meat in savory vegan dishes and poached fish in coconut milk was a beautiful culinary awakening. When I returned home I began experimenting with these amazing flavors. 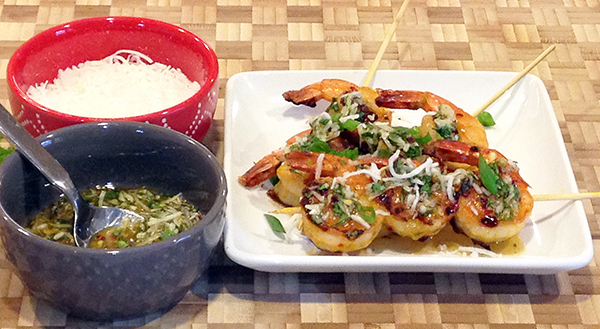 Ten years later I’m still cooking with curry and coconut with this delightful shrimp dish. Unlike many heavily breaded coconut shrimp recipes, these are grilled; the result is wonderfully fresh. The best part is a much cleaner taste and slimmer waist, my favorite food combination. Enjoy! In a medium size mixing bowl, combine 3 tablespoons curry powder, garlic, coconut milk, 1 tablespoon green onions and 1 tablespoon lime juice. Add shrimp and stir to combine. Place plastic wrap over bowl, directly over shrimp to remove as much air as possible. (This will allow the marinade to penetrate the meat more efficiently. While the shrimp is marinating begin the sauce so the flavors have time to marry. In a small mixing bowl, combine honey, remaining lime juice, zest of 1 lime, shredded coconut, cilantro, remaining 1 tablespoon green onions and ¼ teaspoon curry powder. This is a really great question, given how tempting unhealthy options can be for busy families like mine. My best advice is also the simplest: Remove temptation! It’s so much easier than it sounds. Start with tossing out the junk and replace it with flavorful alternatives that will keep you satisfied and feeling incredible. Stock your pantry with brain-boosting snacks like roasted chickpeas, nuts, dark chocolate and dried fruit. Incorporate raw food into your main meals, too. Raw food is packed with nutrients and the best part is, it’s about as quick and easy as food prep gets. Think tender shaved asparagus tossed in olive oil and vinegar, kale and pine nut slaw or cucumber and radish salad in a bright lemon vinaigrette. Pair these side dishes with seafood or pasta and you’ll be fit and fabulous in no time.